Housatonic offers a wide range of classes, clubs, and activities. The one thing that is missing are sports teams. Luckily for the school’s sports fans, Webster Bank Arena, formerly known as The Arena at Harbor Yard, is just a few blocks away. 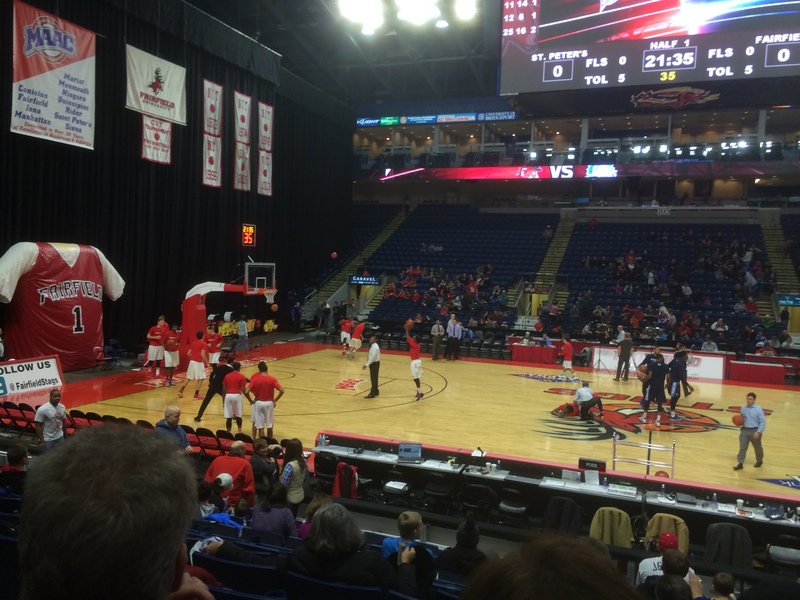 The arena, for short, currently hosts the Bridgeport Sound Tigers of the American Hockey League and Fairfield Stags Men’s Basketball. The Female Stags will also play some games at the arena this season. The Sound Tigers are an affiliate of the National Hockey League’s New York Islanders and have been playing in the Arena since its grand opening in 2001. The Fairfield Stags have played in the arena since 2001 as well. 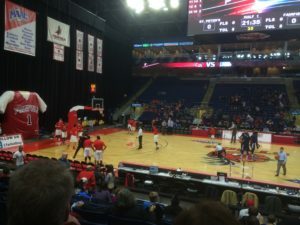 In addition to these two teams, the arena has hosted early rounds of the Women’s NCAA Tournament, the Connecticut 6 NCAA Men’s Basketball Tournament and some Connecticut Huskies games. The arena offers events for non-sports fans as well. The arena has hosted tons of concerts throughout the years. Events such as Monster Jam, Disney on Ice, and the Circus have been held at the Arena. Housatonic student Dishon Francis has only been to the arena a few times but he still remembers his first experience there. “I saw a Cheetah Girls concert there when I was in 4th grade,” said Francis. The Arena serves multiple purposes, but the majority of the events held there are sporting events. For Housatonic students, the closest they come to playing sports in the Arena or the neighboring Ballpark at Harbor Yard is their commencement ceremony. Housatonic student Sidney Rodriguez has always dreamed of playing hockey in the Webster Bank Arena. “In high school, I played hockey for Trumbull High School and we never played in Bridgeport. Our homes games were at The Rinks in Shelton,” said Rodriguez. Rodriguez can no longer play hockey for his school now that he is a college student and his dream of playing in the arena may be in jeopardy. “I know that I am not skilled enough to play hockey professionally, but it would be nice to play collegiately,” said Rodriguez. Rodriguez will have the opportunity to pursue a college with a hockey team after finishing up his two years at Housatonic in the spring of 2017, but he may not be playing close to home in Bridgeport. “I plan on visiting a school in Arlington, Texas that has hockey. I will be able to play there in a few years if I decide to transfer there,” said Rodriguez. Other students are looking for their fix in sports and the Arena is the best place to find it without traveling to Hartford, New York City, or another city even farther away. Housatonic student Eddie Diaz is one of these students. “I go to some Soundtiger games as well as Fairfield U and BU (basketball) games,” said Diaz. Diaz goes to these games to fuel his need for live sports, something that Housatonic does not offer. “If Housatonic had their own sports teams, I would definitely go to those games over the other schools,” he added. Webster Bank Arena would be a great location for a basketball team due to its proximity to campus. The only sport available to Housatonic students right now is a football team that is a combined effort of multiple Connecticut Community Colleges. Diaz was interested in trying out until he found out just how much it cost. “It was $1,000 to play for the team, and I couldn’t afford that,” he said. If the teams were supplied by each individual school, the costs for the athlete could be covered by scholarship. Diaz has experience with playing in the ballpark. “I used to play baseball and we played games at Harbor Yard sometimes,” he said. That experience could be put to use if Housatonic had sports teams. Ankur Chadha is another Housatonic student in favor of sports. “I used to play basketball at Masuk High School so I would try out if Housatonic had a team,” said Chadha. Chadha is in favor of having other sports outside of basketball, which include baseball and hockey. Both are sports that can be played just down the street. “Having sports would give students an opportunity to focus on something outside of just schoolwork,” said Chadha. Chadha also believes that having these teams would help generate money for the school to spend on other projects that can also help students. Kevin Gustave is a student at Housatonic that does not attend many events at the arena. “I will only go if I get invited by someone. I wouldn’t go by myself,” he said. Gustave would re-consider that position if Housatonic had sports teams. Gustave also is a big supporter of schools giving athletes a chance to play. “If Housatonic had sports teams, I think more students would come here in order to play sports,” said Gustave. This is not the only reason that Gustave is in favor of the school adding sports. “I think having sports teams would encourage students to keep their grades up. They wouldn’t be able to play if they didn’t have a certain GPA,” he said. Sports can be a great way to get students to put more effort into keeping their grades up. Roddy Eskew, a student at Boston University, does not play sports but enjoys attending Boston’s hockey games. “I attend about five to seven hockey games per season, sometimes more,” said Eskew. Eskew believes that sports can serve as a bonding experience for students that are spectating. “As most of us (students) come from different places and have different favorite pro teams, going to BU gives us all a common team to support,” said Eskew. Eskew also finds sports as a great way to connect with new people and feels that schools without sports, should consider adding them. “They would certainly add an incentive for people, especially at a community college, where people do not live on campus to meet new people through playing for and supporting the teams,” said Eskew. College athletes also get to learn and experience things that normal students may not. Many former college athletes shared parts of their experience with the Huffington Post. Carly Ledbetter, a volleyball player at Elon University, saw two positives in playing volleyball. One of those is having a support group. “When I arrived at college my freshman year, I had 15 other best friends, a coaching staff that wanted me to succeed, trainers who cared about me, and an academic support team that wanted me to strive for excellence,” she said. Ledbetter also received a full scholarship, which she said was a big help. “Once I got out of school and started working and paying my own expenses, I realized how incredible it is to graduate debt free,” said Ledbetter. Erin Kelly, an athlete at Northeastern University, sees club sports as an alternative to varsity sports. Kelly played for her school’s club field hockey team. “While club sports are certainly not as demanding as Division I, II, or III athletics, playing club field hockey ended up being one the best decisions I ever made,” she said. Jordan Schultz, a basketball player at Temple University before transferring to Occidental College and continuing his career there, learned a valuable lesson because of his basketball experience. “Looking back on the relationships, it’s not just the relationships built, but the camaraderie you learn and how to work with other people,” said Schultz. Robert Sternberg of the National Association of College and University Business Officers wrote that colleges need to have sports, and it is not something that is just nice to have. “As Provost of Oklahoma State University, I’ve concluded that college athletics provide great value on the field and off,” said Sternberg. Sternberg gives a multitude of reasons as to why college sports are important. One reason is because playing sports helps develop leadership abilities. This can even help when looking for employment after college. “Hiring organizations recognize, even implicitly, that college athletes have developed leadership skills in which other students did not have or take the opportunity to engage,” said Sternberg. Sternberg also supports college sports because they can help students relieve stress from the schoolwork. “Athletics and physical fitness activities in general can provide effective ways to channel energy and relieve anxiety,” said Sternberg. Sternberg also explores some of the reasons why people may be against colleges offering sports. One of these reasons is that sports can create a conflicting business model. “While there is money to be made, the programs and related revenue do not serve to enhance the functioning of the university as a whole,” said Sternberg. Having sports teams in college is not always a positive. College sports have their share of negatives. Steven Horvath, a Housatonic student, is against the school adding sports for students to participate in. “The school does not have the budget available to add sports,” said Horvath. Horvath does not agree with increasing tuition costs over sports. Horvath also sees other disadvantages to this as well. “If Housatonic added sports, the other community colleges would have to add sports as well so Housatonic would have a league to play in,” said Horvath. Horvath makes a good point. If Housatonic added teams, they would have no other community colleges in the state to play. “Other schools would have to add sports as well to fix the problem. The whole situation would be a mess,” said Horvath. Former college athletes also voiced their opinions on some of the issues they have with college sports. Andy McDonald, a former baseball player at University of Wisconsin – Parkside had a negative experience with college baseball. “As you start to move up, people start taking it way too seriously,” said McDonald. Not only was it becoming too serious for McDonald, it was also becoming less and less fun for him to continue playing. “High school made me question playing baseball, but college made me hate playing baseball,” said McDonald. Sumorwuo Zaza is another student that had a rough time with college sports. Zaza played football at Harvard University. “I tore an ACL a year. My senior year in high school, my freshman year in college and then my sophomore year in college,” said Zaza. After trying to comeback from the first two ACL tears, Zaza was forced to end his football career after complications during surgery for his third ACL tear. “I immediately called the head coach of the Harvard football team, Tim Murphy, who’s a great guy. He was like ‘This is the end of your football career. Even if you try to play, I won’t let you’,” said Zaza. If Housatonic does not add sports, Housatonic students are still interested in supporting other local sports teams such as the Bridgeport Sound Tigers. Austin Del Salto, a Housatonic student, proposed a “Housatonic Night” for games of nearby teams. “It would be a great opportunity for students to connect with each other since we are a community after all,” said Del Salto. Del Salto also proposed some possible ways this type of event could benefit students. “Students could get free, or discounted tickets to the game, and get a t-shirt or something. Although this type of event is more about bringing students closer together,” said Del Salto. For non-athletes, being a spectator is a way to bring students together with the ultimate goal of cheering for their school. David T. Smith polled students at the University of Michigan to see which sports they discussed the most with other students. “The overall response is that 67% of students discuss college sport the most,” said Smith. College sports give students another conversation topic, and allow them to create friendships through discussion of the sports. Rodriguez will continue to hope that he is one day, able to play in the Webster Bank Arena. Whether it happens while he is a student at Housatonic, he has no idea. “I’d hope that the school adds sports. If not, I’ll get on the ice there eventually,” said Rodriguez.